Spartan Chemical Company, a recognized leader in the formulation and manufacture of sustainable cleaning and sanitation solutions for the industrial and institutional market, announced today the first ever scholarship program for the Building Service Contractors Association International (BSCAI). The Stephen H. Swigart Scholarship will be awarded to one student each year who meets or exceeds certain standards set by the BSCAI committee. The mission of this scholarship is to provide funds to the student that will promote the welfare of the public as it relates to the contract cleaning and maintenance industry. The scholarship was announced by Michael Diamond during the BSCAI CEO Seminar in Grand Cayman, Cayman Islands. 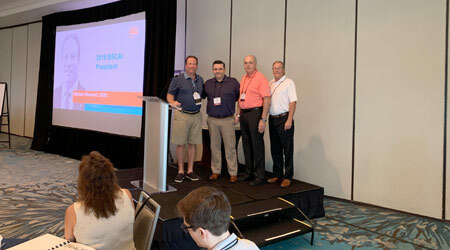 Spartan was represented by Frank Trevisani, building service contract director, Jerred Attanasio, manager of building service contactors and Bill Stewart, west coast building service contractor manager.